If you have an active family, keeping everyone organized is always a challenge. There are bags, coats, keys, athletic equipment, and all the other things your family uses (and needs to store) on a daily basis. Where do you store everyone’s stuff so no one is late for work, school or activities because they can’t find something they need or is left cleaning up the mess at the end of the day? We can’t guarantee that you’ll never be late for work again, but we can offer some solutions “we learned at school” to help manage daily clutter. Whether clutter builds up in your home’s primary entryway, a mudroom, or even in your laundry room, these ‘tried and true’ storage solutions can help get it under control. You may remember cubbies from your school days – small, deep storage spaces with large openings, typically arranged in groups, and often with a pull-out tray or drawer and a handy place for a name label. They’ve been very efficient storage spaces for students for decades, so why not try them at home? It’s important to plan according to your storage needs. Cubbies provide “stop and drop” storage to contain clutter at the entrance, preventing it from migrating to other parts of the house. Cubbies can offer personal storage space for each household member, or even for each “activity” such as a place for pet supplies or tennis equipment. Cubbies should be at least 12-inches deep to be efficient. Cubbies can be open units or can have doors to hide the contents, depending on your preference. 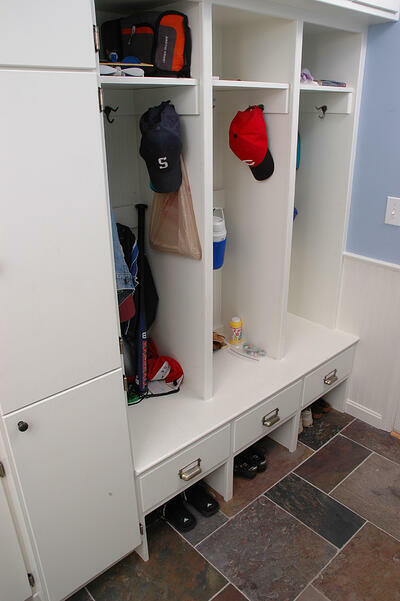 Cubbies can be equipped with baskets or small bins to store hats, gloves, books and other small items. Options: You can purchase pre-made hall storage systems with cubbies, or stand-alone cubby furniture pieces, but they may not be the best fit for your space or storage needs. If you want to create a functional storage space that blends with the interior of your home, we recommend custom-built cubbies. 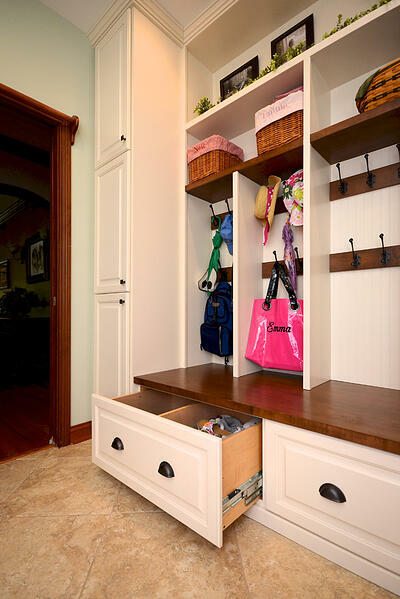 Since entryway storage is intended for daily use, it may be worth the expense of having a professional remodeler measure your space, speak with you about your needs and create cubbies specifically tailored to your family. Height. Think about the locker’s height relative to the age of family members. The optimal height for teen and adult users is about 70-inches. Width. Width is determined by your needs and available space. Depth. Lockers, like cubbies, need to be deep and, in order to hold coats, backpacks and the occasional hockey stick, 18-inches is a good depth. Access. Units can be adjusted for young children by placing shelves, hooks, pegs and baskets at lower height for easy access. Options: Lockers are a bit more difficult to install than cubbies and many homeowners may not have the skills or carpentry experience needed for the project. Some retailers offer modular locker units, but often one size does not fit all and costs can rack up. One advantage to modular lockers is that they come in a variety of materials, like wood, metal or plastic, to complement the style of your home and meet the needs of your family. Cabinet manufacturers often include locker cabinets in their semi-custom lines. There is also the custom-built route. As with cubbies, the value of having perfectly designed and constructed lockers installed by a professional may be worth the cost. When planning entryway storage, consider if open shelving or a bench with storage might be useful in the space. Drawers can also be an asset in an entryway or mudroom to provide space for your gear and keep the clutter out of sight.